The Ambergris Caye Wetland Committee is moving fast with their concept plan to have three areas off and on Ambergris Caye declared as reserves. Along with public consultation with stakeholders, policy makers at the executive and ministerial levels are working on the concept document which will see three areas; Mexico Rock’s Marine Reserve, Bajos proposed Marine Reserve and Mata/Cayo Frances lagoons declared as reserves within two months. Unlike the opposition the Hol Chan Marine Reserve received when it was first proposed back in the late 1980’s, the ACWC received unanimous support from the attendees of the Thursday, January 5th public presentation at the Lion’s Den. The smallest of the three proposed areas will be the Mexico Rock’s Marine Reserve. This particular area starts north of the Palmero Channel area, runs five miles south to Mata Channel and 1.5 miles wide for a total of 8.75sq miles. It is proposed that the reserve will begin at the coastline sea grass bed area and extend east to where the reef shelf drops off. A “no-take” zone is designated in the middle of the perimeter, which is currently used for recreational activities. The size of the no take zone is proposed to be 1.5 square miles (one mile running along the reef and 1.5 miles running east to west from the outer fore-reef). The no take area is positioned so that there is a 1.5 mile buffer on the north and south sides of the perimeter. Should the proposed site be approved it will be managed as a marine reserve. 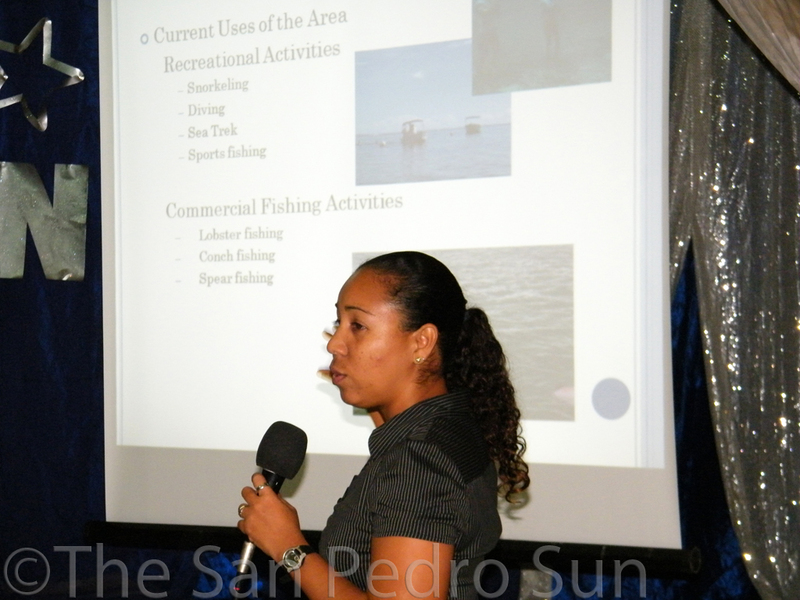 Marine Reserves in Belize are used as fisheries management tools under the Fisheries and Marine Reserve Act. This means that those managing the reserve will have to identify traditional users into the statutory instrument governing the reserve. Once these traditional fishermen are identified they will be permitted to use the area. The proposed Mexico Rocks Marine Reserve will be managed by rangers with an agreed park fee. 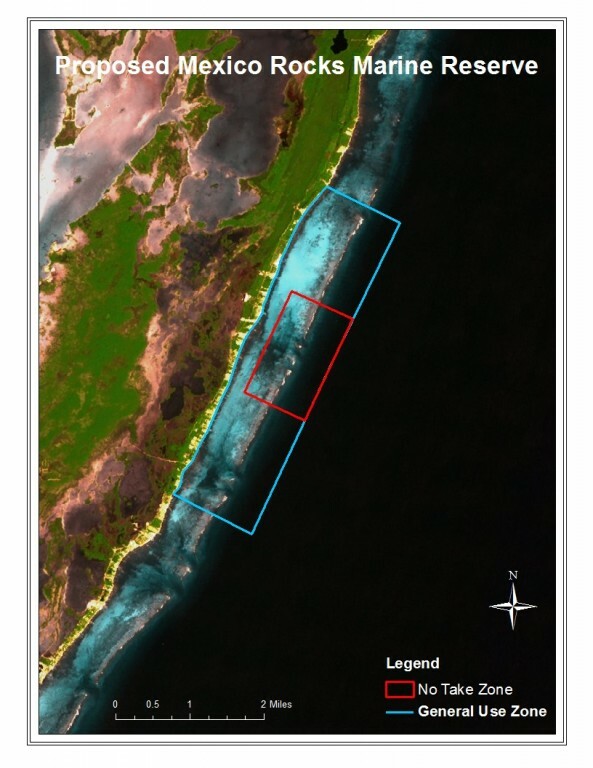 The second area proposed is the mangrove wetlands area in the central part of Ambergris Caye. 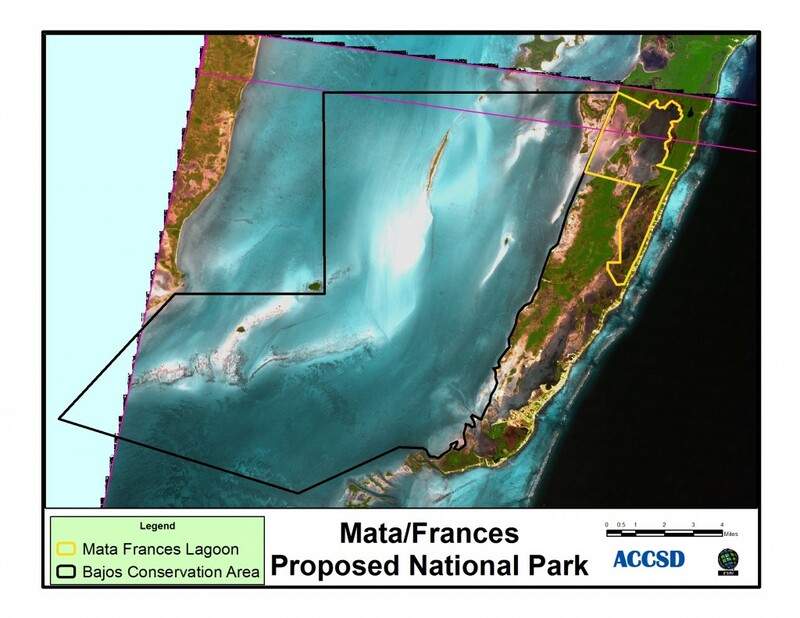 The document proposes that Mata and Cayo Frances lagoons be designated into a National Park. The southern border of this proposed national park is located three miles north of San Pedro Town. According to ACWC, the proposed area is bordered by Social Security lands to the west, and hotel developments on the coastal dunes of the windward side of the island. For the most part, the area is considered Government Land. The site is dominated with inundated wetland with several inner island lagoons interconnected by a network of channels that are highly influenced by tidal exchanges of water that transport sediments, nutrients and many species throughout the system. The proposed area also entails many sink holes that lead into an extensive array of underwater caverns that are yet to be explored. The area is also rich in flora and fauna and has been used as hunting grounds by many locals. While there was no opposition to the concept, a few residents were concerned about the path of the proposed national park where it borders the hotel developments and private properties. Residents suggested that a buffer zone be included to discourage major and large development along the shared border line. According to the ACWC, they are working very closely with private property owners in establishing the area as a national park without any major setbacks or opposition. In an interview with Hol Chan manager Miguel Alamilla, who is part of ACWC, Alamilla explained that a management document will detail how they plan to deal with developments, landowners and management of the proposed national park. Should the proposed wetlands protected area be given the green light; it will be managed as a National Park to be established under the National Park System Act of the laws of Belize. This will mean that nothing will be allowed to be extracted from the area, however recreational usage such as catch and release sport fishing will be encouraged in the lagoon section. The largest of the three proposed area is the Bajos Conservation Area. 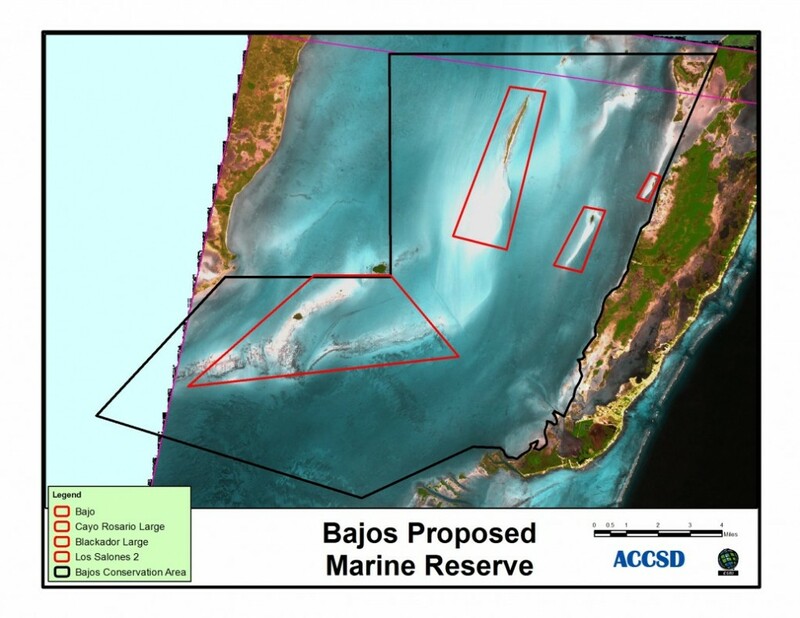 The proposed Bajos Marine Protected Area is located between the southern portion of western Ambergris Caye and mainland Belize. It is bordered by the Corozal Bay Wildlife Sanctuary on the north and the Hol Chan Marine Reserve on the far south-eastern end. The proposed site has a total area of 135 square miles including the shallow, semi-contained marine bay called the Corozal Bay. A total of nine small islands are found within this site. Also of significance are five shoals associated with these islands. These shoals are important habitat for schooling tarpon, permit and bonefish which are key target species for fly fishermen. According to the Minister of Tourism Hon. Manuel Heredia, already the Government of Belize has reacquired two of the Los Salones islands from private developers along with shoals around the general area. When established as a marine reserve it will be managed similar to the proposed Mexico Rock’s Marine Reserve. The proposed protected areas will physically link all the northern marine protected areas, thus creating a biological corridor. The biological corridor will see El Sancturio del Manatee along the Belize-Mexico Border up to Xcalack, Mexico, Arecefe de Xcalak, Corozal Wild Life Sanctuary, Hol Chan Marine Reserve and the three proposed protected areas. The consultation had representation from a wide cross-section of the San Pedro community including business owners, developers, land owners, fishermen, tour guides and politicians. With no major opposition from the citizens of Ambergris Caye the proposed protected areas are expected to get the green light from the Government of Belize. Minister Heredia said that he has gotten full endorsement from the relative ministers during a Cabinet meeting. Heredia explained that the technical people in the relevant departments are finalizing the documents which should be ready and approved by government within two months.